Winners at AUT University’s inaugural Flavorz09 film festival for student video makers say they are now inspired to break into the industry. Sophie Johnson, who won the year three prize of $350 for her 12 minute documentary, The Makings of a Kaitiaki, was delighted with her success. “I worked quite closely with a group of eight people and I know how hard each of them worked. I feel really honoured to receive this tonight,” she said. 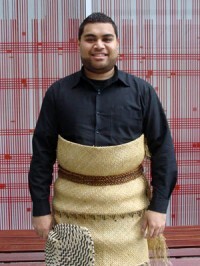 The film was a short biopic about kuia Nganeko Minhinnick, a kaitiaki of the Manukau. Hosting the public showing of 11 Māori, Pasifika and diversity short films for AUT’s Pacific Media Centre, presenter John Utanga, a producer of TVNZ’s Tagata Pasifika programme, was impressed with the quality. The festival was held for the second time on December 3, 2010.